Most commonly asked question: size? It is 10x 12 (120 square feet). When we finally relandscaped our back yard after more than 30 years, I got to have a shed for my hobby and my husband got his garage back. I'd been crafting in the garage, with no windows and no insulation, for ten years! It's been a little over a year now and the shed has gone through several name changes. The "shed" certainly wasn't going to cut it. My "studio" seemed too, too for me. I settled on my "workshop" until my grandson Adam asked one day if he could go out to my "playhouse." Playhouse? Well, gee, of course, why didn't I think of that?! It's so nice to have things counter-high now! Unfortunately, this deep shallow drawer cabinet was purchased from a friend who had purchased it at a knitting store that was going out of business. They are sometimes called "map drawers" or "architect's drawers" (for plans). I believe new ones are very expensive, but maybe one could be found on Craig's List or on EBay. It's the best thing I own. It perfectly displays hundreds of wooden stamps in those very deep drawers. And, yes, that beautiful desk DOES get used! I think the pictures above are fairly self-explanatory, but I've had people ask for details, so I've taken a few additional pictures (below) and will explain how I organized my crafting playhouse. Perhaps you will like some of what you see and be able to use it, or be inspired by it. I know I looked around the Web to try and find blogs such as this when I was planning the space. What I also know is that organization is such a very personal thing. What works for one person will definitely not work for another person. Some people can work with a cluttered work space, other people have to have it clean and uncluttered. To each her own, but I'm happy to have you visit and see if anything at all works for you. I learned in ten years of stamping that I had a brain that preferred my papers, pens, ink pads, and ribbons to be organized by color and my stamps to be organized by theme. 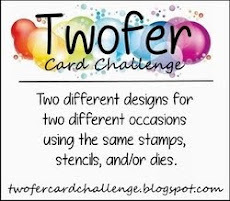 Now that I am entering challenges, people want to know, for instance, what Stampin Up! set a particular stamp is from and I usually have no clue because I break up the sets as you'll see in the close-up below. It would give some people hives, but it's what works best for me. So far this has proven to be the most efficient way for me to work. The bottom drawer containing the paper used to have paper placed simply from light to dark, no matter what brand. Now I am starting to put the SU papers in file folders by name so I can post the right name of what color I use if it's SU paper. This just works best for me. I found that if I left the SU stamps in their "sets," I wouldn't remember that, for instance, a thank you set also contained a flower. With my poor memory, I make more use of my stamps by putting all the thank you stamps together and all the flower stamps together, and so on. Here is a close-up of the 12x12 acrylic bins which hold my patterned paper. Of course the paper is organized by theme (circles, stripes, kids, etc). I tried organizing the sheets by color, but found that with the patterned paper, that didn't work for me. I use them more often now that I've organized them by theme. The bins are Display Dynamics Perfect Paper Stackable Paper Trays from Scrapbook.com. And finally, since the original pictures were taken, I have put this sweet cabinet in one of the corners, instead of a bookcase, and it holds a bunch more stuff. 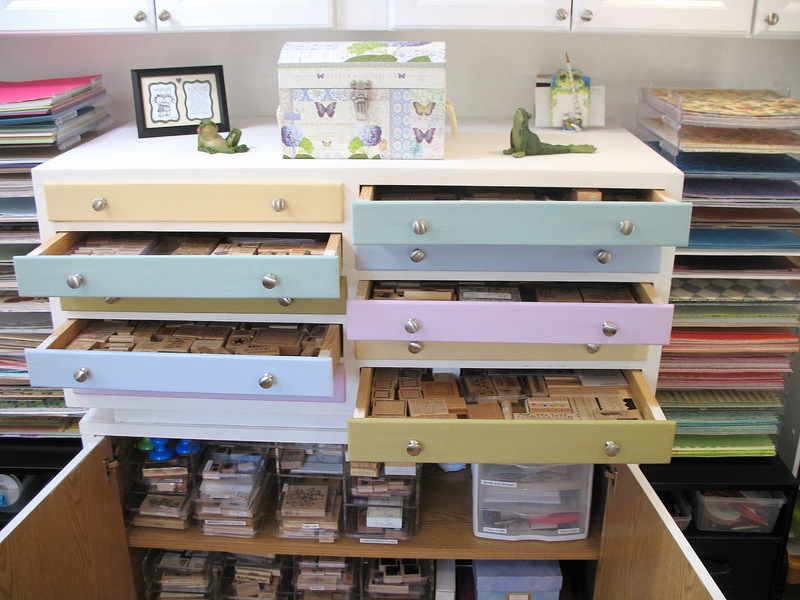 All my reinkers, embossing powders, glitters, Cuttlebug plates, and punches are in the drawers. I thought you might like to see a picture of me "paying my dues" crafting in the garage for ten years! I started this hobby in 2002; this was taken in 2006. Feel free to email me (darnell dot knauss at gmail dot com) or post a comment if you have any questions about how I organize my crap craft supplies. Thanks for looking! Oh my Darnell, it was worth waiting 30 years for! Gorgeous - I bet you nearly live in there. Wowza!! What a wonderful "playhouse"! You deserve it! Oh my word!! Your Playhouse is out of this world - absolutely fabulous, and everything is sooooooo beautifully organised. i'm so jealous of your playhouse it's awesome. What a dream space!! I just visited your "playhouse". Fabulous! What a great organized person you are! Love it! Your "playhouse" is a dream.Just fantastic. I need that sort of order.I'm so inspired by it. Oh I just love your playhouse - so very organised. I had a little shed for a while, but in the cold and damp of Northern Ireland it wasn't all that practical - so I eventually got a craft room built on a mezzanine inside - much better suited to our climate! Sunny California would be just perfect for crafting outdoors! Wow, what a dream house! Lovely! I break my stamp sets apart also. They are much more user friendly that way! Darnell your playhouse is right up my street, I love to be organised so I am mesmerised by your space. In fact yours is the 2nd tidy studio I have seen today. It's made me feel so much better knowing there is just not me who likes things in the right places. Oh I love your playhouse so much! It's so beautiful and fun. Your backyard is lovely and the sitting area you have right outside is just so pretty. I'm going to hunt down where you live so I can come over. This is fabulous and your organization skills are superb. What a wonderful space! Oh wow. Now I'm really excited. I just viewed your profile and you're in Cali, just like me. I'm between San Francisco and Sacramento. Can we schedule a play date? Wow!!! I am sooooo jealous! Your hideaway is fantastic! WOW your playhouse is brilliant - I've just turned several shades of green. Beautiful playhouse, every crafty girls dream. You are so organized. Finally! Someone like me who organises by theme rather than manufacturer! Yay! Your playhouse is to die for and is just divine, I'm V envious - but one day, will have something similar, even if it's a room rather than a whole shed to myself. Though that would be just heavenly....LOL Thanks for sharing your space with us! I absolutely love your craft room. And what a wonderful name that your grandson came up with - The Playhouse. It's so right on. You have definitely inspired me. We're downsizing and my husband and I were wondering what we'd do with my new-found hobby. Now we have a perfect idea of what we can do. Thankfully I won't have to give up my supplies to make the transition. I love your space. Thanks for sharing it! I think you should call this your dream house! You are a lucky girL I am in complete awe of your organizational skills as well. I hope you have many, many hours of delightful play in your wonderful playhouse! Thanks for visiting my blog and leaving a comment, just thought I would check on yours and oh my goodness your little playhouse is amazing, I think you should have a bed in it then you would never have to leave. I just love it. Your playhouse and garden are amazing! You are soooo lucky! I would love to have a place like that to escape to...My daughters are 14 and 9 this year so I think I will have to wait for the eldest to go move out first! Thanks for coming to visit me so that I could visit you and find something to aspire to! Wow to this amazing kraft home. All of it is so amazing. My brother built one similar for his wife and its her quilting room . TFS your beautiful room , you are blessed! This is absolutely my dream! You are truly truly blessed, Darnell. Thanks for sharing and thank you for visiting my blog. Your kind words led me straight here ... and I'm so glad I came! OMG, what a marvelous playhouse - out of the mouths of babes, they tell us what things really are! Your grandson is a genius. Nothing else could better explain what this little building is! I want one just like it! We bought the 3 acres next door with that in mind! Now I have a plan! Thank YOU! Wish I could come play with you! WOW...the Playhouse is knock down goregous...!!! Love the landscaping outside, but the inside is just as cool. Great colors, love the glass surfaces and all that white to play off. Must go read more. Color me green...as in a tad bit jealous!! Ah well, I'm thankful to have a room for myself. Hope you're having a good weekend. oooooh, a dream this place... love it sooo much! This is like a dream! You are so lucky to have a little studio like this!! It's so cute and bright. I love it! Oh my what an adorable and well organized place you have created to stamp in!!! If I didn't have my own place I would be extremely jealous. So glad you aren't in the garage and love your tips on organizing - very nice. Wow. and that pretty much says it all. What an amazing space for you. Well done! I've just come out of your playhouse, what a wonderful crafting place I love it. Also, apart from having a likewise desk orientation my organising/storage systems are very much the same as yours and I also cannot abide mess and clutter. I like to know where everything is. Oh my. I am in love! Your space is fabulous and so wonderfully organized!! Heaven! I wasn't sure if I left you a comment about your 'play house', but I just have to tell you how amazing this is! 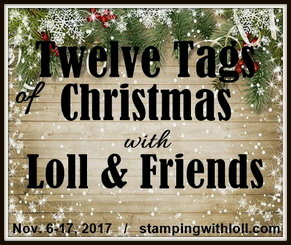 What a great idea for those of us who do not have a dedicated stamping space or if our house is small and there's no room inside (like my house). I want to come over to play!!! It's so neat and organized! Beautiful, just beautiful! NOT FAIR Darnell! You get a whole building for your craft? And you get to have it all organized beautifully and neatly? Wow! I love your space! Thank you for visiting me so that I can be inspired to organize like you. Just fabulous! What a wonderful play room! I'm in awe of your organisational techniques, I'm very jealous lol! You have everyones dream studio!AND it is in SUCH a cute little house...It appears you also have a wonderful view as you look out! Your organizational skills are to be admired and I would like to see if your workspace gets as crazy as mine does when "creating"! Thank you for sharing all your wonderful pictures and idea's. OMG! I am moving in with you. How fun is this?!! And I love the OCD thing...I have it too! hehe! I want to come and live in your playhouse, wow !!! What a dream lucky you and tidy you ! This is just fabulous, and what a gorgeous view you have! All the comforts of home in your own little playhouse! Who could ask for anything more? I'm so happy for you! OMG Wow, Wow! What a pretty playhouse - it looks gorgeous from the outside & amazing when you see all the goodies you have inside! In my dreams ....! WOW! I'm speechless. This is adorable and eviable and functional. I think calling it your playhouse is perfect. How wonderful to be out of the garage. And now I'll stop feeling guilty about how many supplies I have because I realize it's all relative. Since I don't have as many as you do, I can continue to pretend I'm not an art store addict. : ) Thank you for coming by and visiting my blog. What a perfectly wonderful place, Darnell! A place all your own, with windows, and fresh air when you want it, a getaway when you want it to be, where you can leave something "in progress" without worrying that it will get disturbed. You are one lucky lady! Thanks for the tour and all your ideas! WOW!! Your playhouse makes me very happy for you!! I also LOVE how neat and tidy it is - I, too, have a hard time working in a mess. LOVELY!! This is wonderful for me to find. My husband just finished building my "craft barn" and I have the same size space as you. So many ideas for me to look at. Thanks for sharing! I was wondering where you got the "lazy susan" style organizers that are on the glass table. I get a "cannot access profile" when I clicked on your name to answer your question personally, so I can only hope you come back and see this. The carousels are sold by Stampin Up'. The name is "Stack & Store Caddy." If you do a search on Stampinup.com, you will find them. They aren't cheap, but I had so many brads and eyelets and the like, that they were worth the money to me. Good luck with setting up your Craft Barn! Feel free to email me directly and I'd love to see pictures! This is an amazing little house!! I love it! Wow! Now it is my turn to say I am glad that Ardyth is our common link! What a playhouse, what a blog!!! My family always jokes about me being OCD....going to use your Organized Crafting Display title from now on! Seriously, I thought I was well organized until I saw your space! 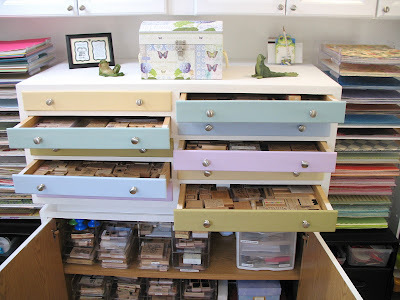 Love the idea of storing your items in the drawers BY COLOR!!! Doesn't it feel good though to walk into a tidy space and not be overwhelmed by clutter. Clutter is such bad energy! I have just signed up to follow you by e-mail and look forward to many more fun visits! What an amazing crafting space - I'm so envious! Love your OCD ideas. This is absolutely beautiful. I will continue to dream about my space! How do you have your PTI stamps organized? Did you break those up too? Thanks! Beautiful playhouse! Caqn I come and play there too? All I can say is that I am so totally jealous of you and your playhouse right now. Do you want to adopt me so I can come live there? A dream come true! Congratulations on your beautiful new "home" - it´s amazing how well organized and pretty your playhouse is. Thank you for inviting us in for a lookaround - and for idea-gathering! Oh what a dream of a "playhouse"! Congratulations! I was drooling as I looked through all of your pictures.. I wish I was that tidy and organized! Beautiful crafting space. Just found your blog! Congratulatons on your wedding anniversary! And I am SOoo envious of your Playhouse - it looks great. Off now to reorganise my very small room! Love your Playhouse. I too can't abide clutter and mess and have things organized similarly. When one of my daughters moved out, I immediately set about converting her bedroom into my 'playroon'. Now I have so much stuff, I need a bigger space. LOL. I just peeped into your playhouse! My oh my... that is so lovely! I am green with envy! OMG, you lucky duck! That is fantastic! That idea wouldn't really work for me since I have a 10 ft. snowdrift in my backyard right now, and wouldn't want to have to shovel my way out there! Luckily I have my own craftroom in a spare bedroom. It's about the same size as yours, but not as well lit, and not nearly as organized. You have me thinking of some ways to better organize my mess. This is just the sweetest place to "PLAY". I just love your little get away Playhouse! SWEET, SWEET, SWEET! Gobsmacked! Coming over to play! Get the kettle on please. Oooooh MY gosh! I am soooo happy for you to have your own oasis! How COOL is that?! It's so pretty and organized and... I WANT IT! LOL! Gorgeous space. Love the deck and trees too. The whole space is beautifully designed. Looks like heaven! So jealous here! Oh my. I'm drooling with envy here. LOL. LOVE you playhouse. I want come over and play! ;-). LOL! I am driven by color too - right now I am so green with envy! Wow - this is so cute and so well done - you are a lucky duck! TFS. Oh!! I love your little playhouse!! and all the wonderful organization ideas! I need to bookmark this post as my husband and I are planning to do something similar in our back yard. At the present I have half the living room and there is no way to close it off from the rest of the house and it is hard to organize and open space. Oh My... I have just fallen in love with your playhouse. It's absolutely gorgeous and soooooo organised. I must put one on my 'wish list' Thank you for following my new blog and for your lovely comments. WOW! Your playhouse is beautiful! Literally beautiful from the outside and inside is so organised and neat and clean - my kind of place!! You have a beautiful playhouse, I love how everything ISO organized LOVE IT!!!!! What a wonderful space and I think "Playhouse" is the perfect name. I'm in total awe of this wonderful place and of your superb organization...! You could make a fortune going around and organizing craft rooms for those of us, who do not have that talent. I just LOVE everything you have done and also your wonderful creativity in coming up with so many wonderful ideas!! This is one of the most amazing craft spaces I have ever seen, and I think it's like a dream!!! What a perfect playhouse! I love how bright and well-lit it is, perfectly organized, and a beautiful view to boot! Love it! I could not access an address for you via your comment to respond personally. I left a note for you on my blog, but I thought I would answer here, in case you come back looking for it here. First, thank you for all your sweet and supportive words! I appreciate that very much. Unfortunately, that deep shallow drawer cabinet was purchased from a friend who had purchased it at a knitting store that was going out of business. They are sometimes called "map drawers" or "architect's drawers" (for plans), but I believe new ones are very expensive. Maybe you can find one from Craig's List or on EBay. It's the best thing I own. It perfectly displays hundreds of wooden stamps. Oh my goodness! I am so jealous! I'd love to be able to be so organised, but out of necessity I am a "Everything stacked in one huge pile" crafter! OMG!! Where do I start? I Love everything about your play House!!! Including your Yard!!! STUNNNNINGGG!!! I am so JEALOUS!!! Oh my goodness! A dreamy play house indeed!!!! Beautiful space and yard!!! I'd love to play in there! and i know what you meen about finding the right name for your space.. I'm still deciding what to call my room... I hear lots of people say studio, but i don't think it fits me, I sometime say scrap room, but i do way more than scrapping, so far i'm hovering over crafty room/space... Maybe it should just be my playroom/toy room? I did always want one of those as a kid!! lol Thank you for sharing, I'm now going to have to send my mom the link for her to drool over too!! Oh Darnell, your playhouse is gorgeous, and very organised. I am envious!! And a dreamer. 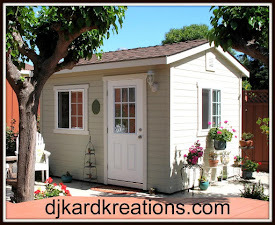 I've always loved little sheds, cottages etc and would really love to have one for my studuo. BUT I live in Iowa and the weather would play havok....heating, air, and shoveling snow to get in or out, no running water. So it's a dream in the back of my brain. Thanks for sharing the organizational aspects of your space . Ideas that can surely help. Love the natural lighting too. Inside and out are all beautiful spaces. Thanks for sharing all the photos too. It is just a fun spot to create. This is an amazing space and I want one!! My girls have a playhouse just a touch smaller than this...thinking I might need to take it over. :) I love what you've done with the place. I am absolutely green with envy at your Playhouse. The name is perfect and so is the space. Your organization is amazing! What a wonderful craft world you have -- so organized! Beautifully clean ---- a wonderland where you create your magic! I am GOBSMACKED!!!! OMGosh that is absolutely amazing!!! And you are a genius organizer as well as a very talented crafter!! I'm Pinning this in hopes maybe my hubby can get some inspiration or ideas for something like this on our property!!! Thank you so much for sharing and wishing you much JOY in crafting!!! I LOVE your playhouse and OCD! Following you now, please follow me...Thanks for joining the BBTB2 challenge! Oh my goodness, I am in complete envy. Your playhouse is absolutely fabulous and you have the outdoors and a relaxing chair right there! Thanks for sharing your special place with us at BBTB2. Your crafty "playroom" is amazing !!!! I love the design and the way you have organized every single thing !!! This is truly a dream craft space and what beautiful scenery to enjoy as well !! Thank you so much for sharing these photos with us at BBTB2 !! 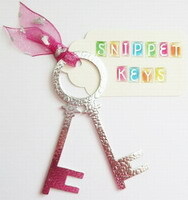 I LOVE your crafty space! What an awesome idea! I could have a lot of fun in there! Thanks for linking up with BBTB2!! Your playhouse is wonderful Darnell. You are so well organised. Thanks for sharing with us at BBTB2. This is a DREAM!!! WOW WOW WOW!!! SO JEALOUS, but so happy you shared this with us at BBTB2! It has given me a WONDERFUL idea!!! What a wonderful place to get creative! If I had such a place though it would need AC for summer and heat for winter. Not sure that would be feasible for me, but I sure do envy your creative space. It is beautiful! I'm in the process of working through your wonderful blog so I came across this post with the most amazing craft area any one can dream of!!! This must be one of the most organized crafting spaces out there!! You should see where I do my crafting - a total mess while I'm busy!!! I can just imagine how wonderful it must be to work in this lovely cosy little place!!! Maybe one day I can also have a lovely craft area like yours!!! I'll have to show this to my husband so that he knows exactly what I need!!!! Thank you for the pleasant time I could spend in the Playhouse!! PS. I thought I had a lot of stamps, but I think you have a few more!!!! LOL!! Darnell I LOVE your playhouse! wow! I bet it's so nice crafting away in here especially since you have been in a garage, I love how it looks on the outside and the inside is a dream! I wish I had your OCD seriously your organizing is the best! Thank you for sharing your precious playhouse. 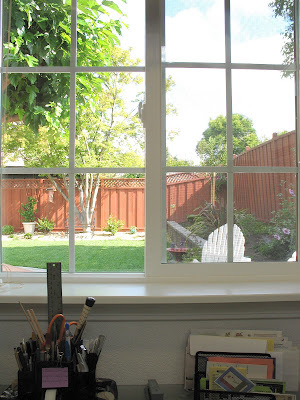 I am so completely jealous of the light in your space, and the fact that you actually "get out of the house" to craft. I'm your newest follower too, and I hope you'll pop back by my blog and see my space under the tab called studio. This is fun! Bente from Denmark. Sorry about my poor english...but i have to thank you for your wonderfull pictures of your Playhouse AND because i now, dont feel that i'm alone in the world, who split up my stamp-set. People think i'm crazy when i tell them about my stamps, and how i split them up. MARVELOUS - loved looking at all the photographs! Oh, Darnell, this is beyond gorgeous! What a beautiful crafting space you have created! I wish I had your organizational skills! Im more like your "garage" picture! Thanks for the tour! What a wonderful place to "play in" ... Oh how I would love to have your organization skills. I have taken over the spare bedroom for my craft room & love it but certainly don't have your talent for making it so user friendly. Finally, I managed to get into your playhouse! OMG! It's amazing and so well organised. I can only dream of having one. I enjoyed the tour and TFS, Darnell! Wow that's one AWESOME playhouse!! Wow what more could a girl want not only a charming doll house but filled with grown up toys and nicely organized. Now that I have read all there is to know about you I can now picture you in your quaint and charming environment. Thanks for the house tour, I would like to have a little playhouse like yours, but too bad, guess it is too hot for me to have one in our backyard here in the desert! Wow, what a beautiful crafty space! I just had to drop you a note about your gorgeous Play House. It's so well organized, bright and probably quiet. I also noticed in that latest picture of you that you have a Hermann Mille Aeron chair!! Do you like it? Does it make sitting at your craft table more comfortable? Lastly, I have started breaking apart my old wood SU sentiment sets and placing them in a file cabint of sorts and I found a way to keep tabs on the set it came from. I simply use a Sharpie and write the name of the set on the side. Thank you for sharing you lovely Play House. Happy Birthday Darnell... I stopped by via Laura Bassen...just HAD to see your PLAYHOUSE!! LOVELYYYY!!! Happy Birthday to you!!! I am a committed new fan! Your playhouse is a dream! I have a tiny little corner in my boy's bedroom so I'm always a bit jealous of people who have a dedicated space but you SO deserve it! I just LOVE the idea of the little playhouse (oops, I almost called it an outhouse). My kids are still little so they take up more time and space than crafting allow but I try :D.
May you have a blessed day! I love it! My sister and I were just planning to put one of these in her yard! Can you tell me where you got your cute little shed at? Laurie, I don't usually reply in a comment because I never know if the person will come back to it, but your comment name is "no reply" and I couldn't leave a comment on your blog because I am not a Goggle+ person, so I hope you see this here. Darnell I am green with envy, your little shed is to die for! I know that if I had one such as this, I would never see my friends or family as I would never want to leave it! holy smokes what i wouldn't give for a space like that!! if it had a bathroom too i'd never leave it!! except it would also need heat here in the NY winters. gorgeous space! What a beautiful space! Love your organization. Oh my, I am just in love with your little Playhouse! Not only does the building itself look wonderful, but your deck and sitting area out in front make it look so cozy. No wonder you grandson thought it was a playhouse! OMG Darnell, my friend Robyn told me to come and take a peek at your Playhouse....it is fantastic! I love it and I love how organised you are. Hi Darnell! Just had to add my 'love this'! My craft room is inside the house (son's old room), and NEVER neat and tidy. I seriously try to be organized, but it gets in the way of being all things to this craft. You're and inspiration! Whenever I feel overwhelmed, I now know where to come to calm and refocus! I absolutely love your playhouse! I want to come in and play! I wish I could get my craft area organized, so thanks for all the great ideas! I absolutely LOVE this more than I can express in this comment box! I must have a playhouse of my own some day, but living in the midwest, winters can get awful cold so I'm not sure if I would want to walk outside when creativity hits. Hmmmm.....maybe some day! I do love all the windows and natural light. I have none in my current craft room. Thanks for sharing this! so January seems to be "get organized" month, so I had to check this out.. GREAT space.. Oh I have a lot of 'ganizing to do for my little space to even look half as well designed! TFS! Gosh darn I love your little place! Where's the roll away bed? oh my gosh!!! on the outside it looks fantastic but on the inside I lack words to describe to you how amazing, dreamy and sensational this space is!!!! I am so jealous haha After years in the garage you totally deserve it it is beautiful!! If one day I will be at the point where I can have my own playhouse I will definitely look back at your organising Darnell!! Thank you for sharing! What a fabulous playhouse! I'd need heat for MI weather :-). I'm envious...my space is only 7.6x9 and I'm still trying to organize it. I may be copying some of your ideas. Thanks for sharing! Where do you live so I can move in with you? I can cook very well, clean better than a pro and your toilet will get a toothbrush daily. What a fun playhouse you have! OMG you are so blessed but i but you deserve every single square inch of that baby. So lovely and something for me to dream for one day. It never hurts to dream! Your Playhouse is awesome and oh so organized!! I want to come and play too! I wish I could come play in your playhouse! Om goodness , I just found you and I'm speechless . You are amazing and your playhouse is to die for--- no not really die . You have a fab sense of humor . Thanks so much . Wow What a wonderful Idea to turn a shed into a play space.I was in a Walk in closet for a long time but with me growing with more and more things, My hubby wanted to build on to it then said you are in that room with all that stuff ! and I have one full bedroom just for my computer so he said he would take the walk in and for me to move in the Bedroom / scrap room now.No arrangement from me so I got busy emptying each place painted them both so they would be nice and clean and fresh. (yes I have OCD) drive him crazy LOL.. I finally got to become a follower, at first it would not allow me to but I kept trying and got it. thank you for following me and I am so happy to be following you. We are In Florida, where are you ? Have a wonderful Weekend and enjoy your 2 grandsons mine are mostly grown up now just have 4 that are young, ages 2- 10.and 3 beautiful Great grand children but sadly I do not see them. we need to keep in touch. Amazing...this looks like a full time, wonderful job. I like to work in a clean area; but within one card construction, my desk can look like a tornado hit it. I keep organizing and changing, but I don't have as many supplies as you do...and probably in the rest of my lifetime won't, hard to use what I already have. Your idea of NBUS is great too. Looking forward to that in the future. Love your blog, so interesting. Wow, just looked at time, I've been on here over an hour...I have to get back to making some cards, but I'll be back. I could look at these pics a million times...LOVE LOVE LOVE Your Playhouse and YOUR amazing organization!! I wish I could play with you in your lovely playhouse!!! N O W A Y ! ! ! ! This is UNBELIEVABLE!!! WOW, what an amazingly awesome craft room!!! What??!! I can't even!! This is the coolest craft room I've ever seen!!! I would live in this, if it were mine. I gotta show my hubby this.. Way cool Darnell. What an adorable 'room of your own'! I love this space...it looks so charming and peaceful! I'm in the process of reorganizing my space...again, so I love your inspiration! Thanks for sharing!! Hello and Happy New Year, Darnell ♥ I just wanted to comment on your wonderful little play place for all the crafting that you do.... wow! Is all I can say. :) You are much more organized than I. And I don't have as much as you. :) One day I hope to get all of my things up and in their proper places. I am inspired by the pictures you have shared. Thank you. I tried to "follow" you on your blog...but the internet must have slowed down. Well, when the blog allows me to follow I will. Thanks again! Have a wonderful create-ful day! I just found your sweet blog because you entered the snow challenge at retro rubber, and being the guest designer I get to comment on everyone's cards.. so imagine my delight when I came to your card then took a tour of your blog.. I am loving your playhouse. It's the most adorable space ever. A place I can only dream of, a bit of heaven on earth if you will a sanctuary. I have my craft room in the front of our older (and I mean OLD) home.. and we are on 4 lanes of traffic with a train yard nextdoor. Not exactly peaceful, but the porch was enclosed because of said traffic/train noise and so my porch is my "playpen" and Book/Bible study room. Works out ok, but I'm so showing my husband your playhouse.. he'd probably build one just in hopes I'd stay out there. *wink Any ways I enjoyed your blog as well. Lovely to look at and so sweet to read.